Lens-based surgery involves inserting a new lens in the eye. The new lens has improved focusing power that can correct nearsightedness, farsightedness, and even astigmatism. The range of corrections possible with lens-based refractive surgery is far greater than with corneal surgery, and patients with very high degrees of myopia and hyperopia can be treated with excellent results and good image quality. There are two primary lens-based procedures: the implantable contact lens and refractive lens exchange. Although LASIK is an excellent way to correct vision in most people with low and moderate levels of myopia, it is often not the best choice for high levels of myopia. When LASIK is used for high levels of myopia, patients can find that the clarity and quality of vision, particularly at night, is not as good as glasses or contacts. For these patients we prefer the implantable contact lens, or ICL. Figure 12. The arrow shows the implantable contact lens (ICL), which has been inserted behind the iris (the colored part of the eye), in front of the natural lens. An ICL can correct high levels of nearsightedness. The implantable contact lens is a tiny, soft lens, about a quarter of an inch in diameter, that is inserted behind the iris, in front of the natural lens (Figure 12). To do this, the surgeon makes a small incision, about three millimeters wide, at the junction of the cornea and sclera. The lens is rolled up, inserted through the incision, and then unrolled in the eye. The lens is then tucked in position behind the iris. The procedure is painless, takes about seven minutes per eye, and is done under twilight anesthesia. You can see better immediately afterward, usually well enough to read a clock on a wall across the room. Most people see 20/20 or better the next day. I generally recommend the ICL to patients whose myopia is worse than –8.00 diopters. I also sometimes recommend it to people whose myopia is less than –8.00 diopters, but who have some contraindication to LASIK and PRK. Currently, the ICL is not available for hyperopia. The implantable contact lens is discussed in detail in chapter 7. If you have hyperopia, or farsightedness, refractive lens exchange may be your best option. Refractive lens exchange, or RLE for short, involves removing your natural lens and replacing it with a synthetic lens. The surgeon makes a small incision at the junction of the cornea and sclera and inserts a tiny vibrating probe. The probe is used to break up the natural lens into tiny pieces and vacuum it out. A new synthetic lens is rolled up and inserted into the eye. It is unrolled in the eye in the space that the natural lens formerly occupied (Figure 13). The procedure is painless, takes about ten minutes per eye, and is performed while you are under twilight anesthesia. The recovery is also painless and patients typically have excellent vision the next day. RLE is the same operation as cataract surgery, but is done for patients who don’t have a cataract. More than 3 million cataract surgeries are done in the United States each year. 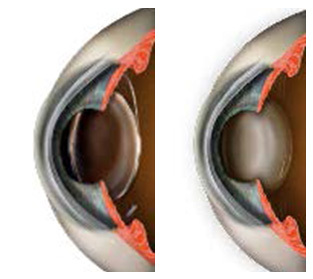 Because of this high volume, cataract surgery has become highly advanced and very safe. RLE benefits from these advances and experience. In particular, over the past decade, highly advanced synthetic lenses have become available. Some of these lenses correct astigmatism, while others are designed to correct presbyopia by restoring both reading and distance vision. These lenses are discussed following. Because LASIK can also correct farsightedness, the choice between LASIK and RLE can be a subtle one. I generally lean toward RLE for higher corrections because the effect of LASIK for high hyperopic corrections can wear off over time. I also recommend RLE if your vision problem is particularly amenable to solution with one of the advanced synthetic lenses, such as the bifocal or astigmatism correcting lenses. If you have the beginnings of a cataract, I much prefer RLE, recognizing that we can fix the vision and cure the cataract with a single procedure. Figure 13. 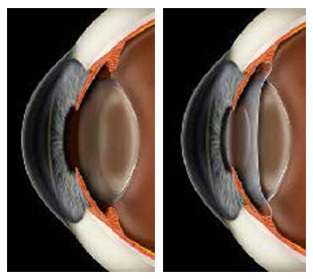 In a refractive lens exchange (RLE), the natural lens is removed and replaced with a synthetic lens. The surgeon chooses a lens with the power to provide clearly focused vision.